The Tabwa of Zaire, now the Democratic Republic of Congo, live on the southwestern shore of Lake Tanganyika, the second largest freshwater lake in the world! 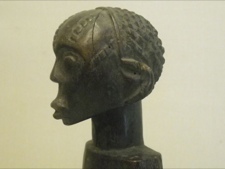 Each Tabwa tribe has historically been autonomous, headed by chiefs that inherit their positions. They can trace their descendants back to the original founders of their tribe. 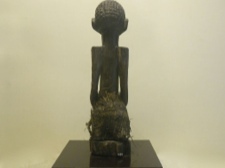 This can be supported through a collection of ancestor figures which represent familial lines. 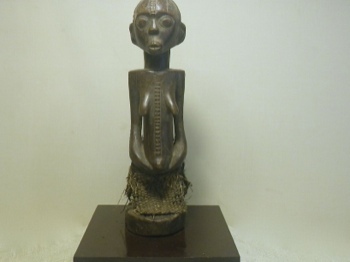 Tabwe carvers produce utensils and tools, but also created wonderful ancestor statues and wooden figurines. 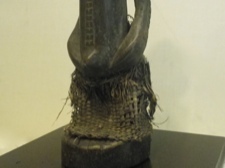 This ancestor figure exhibits tatoos, plaited head, and a grass skirt. It stands 9.5 inches high on a .5 inch wooden platform.